It's been writ that Warner Bros. got back many a negative cost off bookings at Broadway's Strand alone. Here may be instance of that ... Public Enemy in a fifth "All Records Broken!" week, 488,519 people clocked so far, according to a holdover ad above. For Gothamites, Public Enemy was all but a home movie, sensations on screen against a backdrop short distance from theatres where it played. 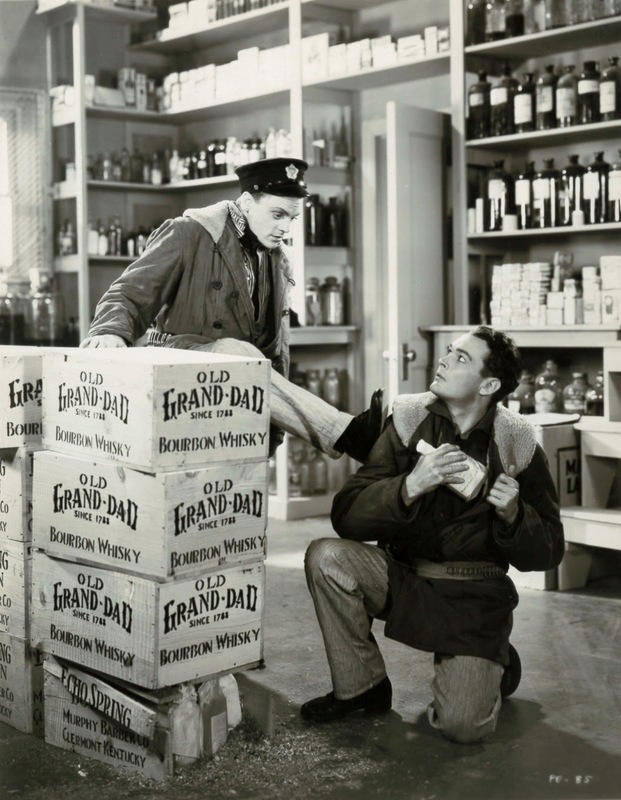 Worth noting is James Cagney's name on neither ad, his still a comet rising. The face is here, and those exiting would not forget impact of that, Cagney as star soon enough to arrive in vehicles his own. 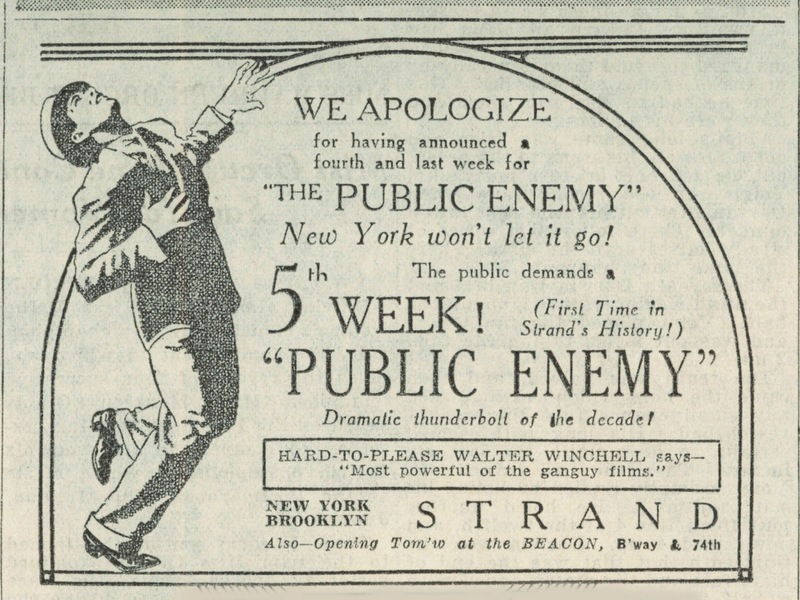 For now, Public Enemy needed but shock of content and word spread like hot butter from those who'd been shocked, to others that soon would be. Whatever flame Little Caesar started, this blazed bigger. Gangster films lost stun capacity as novelty wore off and censorship applied anchors, but for now, it was hold onto your nerve for jolts to equal what outright horrors were serving. On topic of compare with those, I wonder how Strand's mob reacted when mummified and title-role Jim fell through the door at Public Enemy stun-gun finish. Think there were audible gasps? I'll bet so. TCM recently showed "Shooting Straight," a 1930 crime drama directed by George Archainbaud for Radio Pictures and starring Richard Dix. Though released in July of that year, nearly eight months before "The Public Enemy," it's even more impressively cinematic, with fluid tracking shots and pans, striking visual compositions, and unusual camera angles, including overhead shots of the climatic fight scene. What it doesn't have, however, is a good screenplay. The story is complex and implausible, with Dix's big-time gambler fleeing a murder charge in the big city when his train goes off the rails. He's unconscious for two weeks, and when he comes to, he finds that he's in the care of a small town parson with a lovely young daughter, who think that he's a noted reformer, who was actually killed in the crash, because he had the man's wallet. He assumes the reformer's identity and decides to clean up the town where of gambling. The scenes of the town's gambling den have a grittiness to them, but the movie is more of the sort that would have followed from "Underworld," where the world of crime is strange and fantastic. It hasn't immediacy of "The Public Enemy," with mean streets that would have been familiar to every immigrant's child faced with a choice of going straight and becoming an American, or falling into the interstices of a crooked and often brutal life. 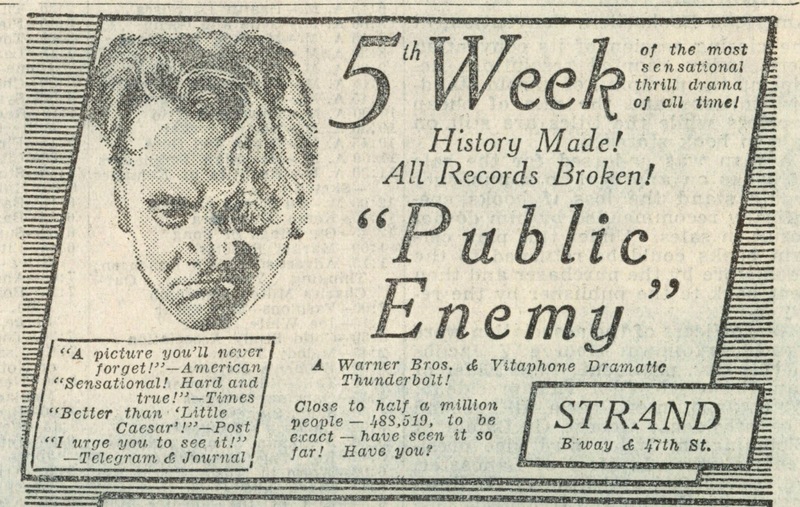 As with "Little Caesar," "The Public Enemy" gave crime back to the people. "Shooting Straight" also doesn't have James Cagney. Richard Dix is a strong, manly presence, and he and Matthew Betz, as the owner of the town's gambling den, are quite good, but neither of them has Cagney's charisma or live-wire quality. An audience watching his performance in "The Public Enemy" will always have a sense of his potential for violence and may anticipate what he'll do, but almost inevitably, what he does is a surprise. Certainly this was a star-making performance. Interesting to see that the New York Times' opening day notice by second-stringer Andre Sennwald calls it "just another gangster film at the Strand'' though he lauds the acting "with the exception of Jean Harlow.'' Ten days later, the Times' first string, Mourdant Hall, praises it to the sky in his Sunday column. Sennwald, 22 in 1931, succeeds Hall in 1934 and dies in a gas explosion in 1936 that the medical examiner says was apparently a suicide attempt because Sennwald was going blind. Did not know that about Andre Sennwald, Lou, or about his review of "Public Enemy." Suicide by gas explosion must have been a pretty rare way to go, although I'd guess he just meant to do it by head-in-oven means, still a pretty grisly means of exiting.